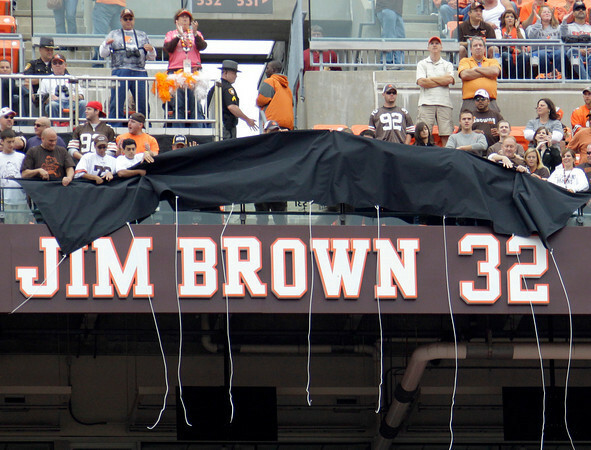 To think that Jim Brown was only inducted to the Cleveland Brown’s Ring of Honor in 2013 is odd. But there’s a backstory. There always is. The Manhasset High alum and gridiron star was on the list of the inaugural 16 to be inducted in 2010 when the Ring first launched, but due to a struggle with former team President Mike Holmgren, who actually fired Brown as a special advisor, the NFL legend never attended the initial event. Fast-forward to last Thursday and Brown got the long awaited honor. He was also rehired as a special assistant to the Browns after Holmgren was fired following last season. Brown was presented the game ball by coach Rob Chudzinski following the team’s 37-24 victory over Buffalo.